Small curb radii are more pedestrian friendly because they decrease crossing distances and slow vehicles at turns. The shape of a corner curb radius (the radius deﬁned by two sidewalks on perpendicular streets that come together at a corner) has a signiﬁcant eﬀect on the overall operation and safety of an intersection. Smaller turning radii increase pedestrian safety by shortening crossing distances, increasing pedestrian visibility, and decreasing vehicle turning speed. The shape and dimensions of curb radii vary based on street type and transportation context. Curb radius changes may be installed as part of a traffic calming project or other public or private initiative. 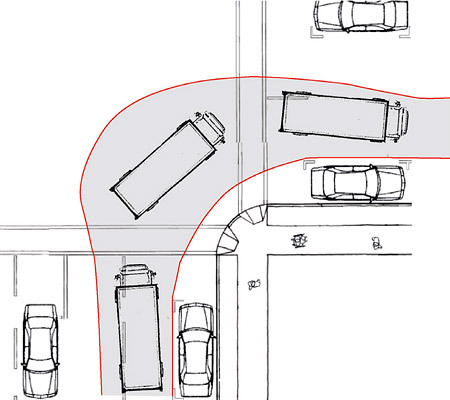 Design vehicle: selected vehicle type used in determining appropriate turn radius at an intersection. Design for [a vehicle turn]: to allow for a particular vehicle type to complete a turn fully within its designated travel lane or lanes. Accommodate [a vehicle turn]: to allow for a particular vehicle type to complete a turn with latitude to use adjacent or opposing lanes on the origin or destination streets. Curb radius: the actual radius proscribed by the curb line at an intersection. 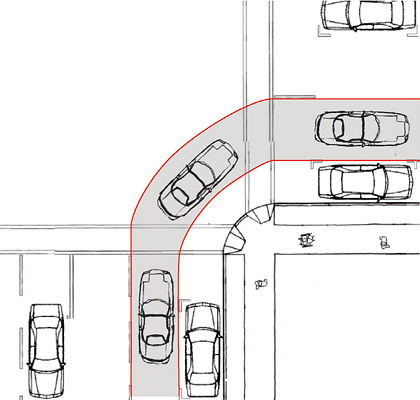 Effective radius: The radius available for the design vehicle to make the vehicle turn, accounting for the presence of parking, bike lanes, medians, or other features. 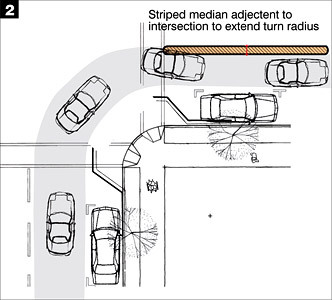 Effective radius: Where a curbside parking and/or bicycle lane is present, the effective radius of the turn is increased. Curb radii should be designed to maximize pedestrian space and shorten pedestrian crossing distance to the greatest extent feasible; the smallest possible curb radius should be used while allowing vehicle movements as described below. 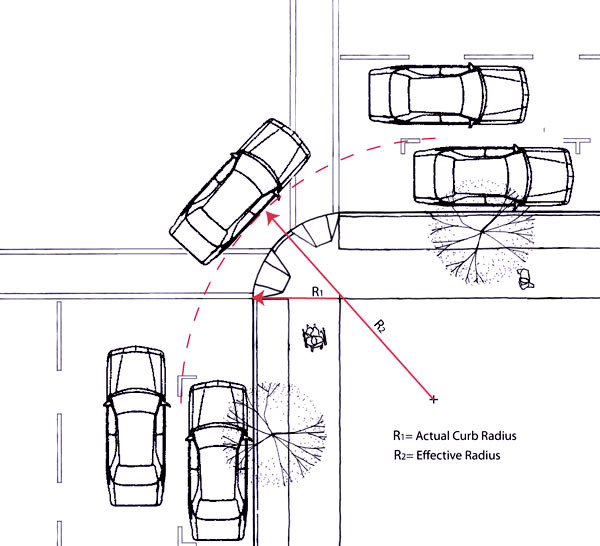 The effective turning radius, not the curb return radius, should always be used to determine the ability of vehicles to negotiate a turn. These guidelines provide a general overview of the bulb-out design process. However, curb radius design is sensitive to a wide range of variables; these guidelines cannot replace professional judgment and technical analysis. Each project should consider the particular characteristics of the site, and adjust the design as necessary. Determining a design vehicle should consider and balance the needs of the various users of a street, from pedestrians and bicyclists to emergency vehicles and large trucks, considering the volume and frequency of these various users. The designer should distinguish between “designing for” and “accommodating” the needs of large vehicles (see definitions above). For example, on designated transit or freight routes with frequent large turning vehicles, streets should be “designed for” these vehicles. Where large vehicles are occasional users of a street, there are low traffic volumes, or other characteristics such as high pedestrian volumes necessitate taking greater measures for pedestrian safety and comfort, designers may consider “accommodating” these vehicles. General conditions apply to all streets where conditions are present as described below. Emergency vehicles: All streets greater than 150’ in length should accommodate emergency vehicle (WB-40) turns within the full right-of-way of the intersection. Because emergency vehicles have sirens and flashing lights and other vehicles must pull over, they can typically use the full right-of-way without encountering opposing vehicles. On busier streets, the ability of emergency vehicles to swing wide may be limited by queued traffic which may not be able to pull over. Transit routes: Transit routes include transit service routes as well as routes transit vehicles use to start their run and return to the yard. At intersections where buses make designated turns, streets should be designed for a B-40 bus. On some Muni community routes, Muni may use a B-30 – check with SFMTA. On other corners along Muni routes, where buses may have to make occasional detours, turns should accommodate a Muni vehicle using the entire roadway, similar to an emergency vehicle. To determine whether a particular intersection is used by transit vehicles to start their run or return to the yard, check with SFMTA. On trolley bus routes, overhead wire locations determine the turning envelope for the bus. No curb radius should be constructed that forces the bus to deviate more than nine feet on center from the middle of the overhead wires. On Muni LRV routes, the curb radius should be constructed such that no part of the sidewalk is closer than two feet from the dynamic envelope of a turning LRV. These routes must also accommodate historic streetcars. On streets where other transit providers are present, the curb radius should be designed for their transit vehicles as well. Consideration should also be given to private transit operators in areas where large tourist buses and vans are likely to conduct business on a regular, ongoing basis. Freight routes: Freight routes are streets that are designated as “Routes with Significant Truck Traffic” on Map 15 in the Transportation Element of the General Plan. Freight routes should be designed for WB-50 trucks. Larger WB-60 trucks may also be present on City streets, particularly on designated state highways and in industrial areas. These may need to be accommodated in certain instances, though they are not practical in most of San Francisco. Standard street types describe appropriate design vehicles to use per street types, based on Better Streets Plan street types. Local streets: Local streets are typically narrower streets with low traffic volumes and speeds, and limited need for large vehicles. Pedestrian-activity streets: Pedestrian-activity streets typically have high volumes of pedestrians, moderate traffic volumes, and frequent need for loading access. They function as the central public space of San Francisco neighborhoods. Throughways: Throughways typically have wide roadways, high traffic volumes and speeds, and more large vehicles. They may have significant pedestrian volumes and/or concerns about pedestrian safety or wide crossing distances. Industrial streets: Similar to freight routes, industrial streets are used for loading, shipping and deliveries. They are typically located in industrial areas with lower levels of pedestrian and car traffic. Compound radius: A compound radius changes the curb radius over the length of the turn, such that it has a smaller radius at the crosswalks, and a larger radius in the center where vehicles are turning. Compound radii effectively shorten crossing distances and make pedestrians visible while accommodating larger vehicles to turn; because they allow more sweeping turns, they do not slow turning vehicles. Compound radii may be considered where there are high pedestrian volumes, or a desire to make pedestrians visible, but a need for frequent large turning vehicles such as right-turning buses. At-grade paving treatments: To accommodate occasional trucks in very low traffic areas, consider a corner design in which the area between the large and the small curb returns is at street level, and is textured to discourage high-speed turns but allow low-speed use by larger vehicles. This treatment has limited application, such as industrial streets. Advance stop lines: Advance stop lines on the destination street can increase the space available for large vehicles to make a turn by enabling them to swing into opposing lanes on the destination street while opposing traffic is stopped. Painted median: Where there is sufficient lane width on the destination street, a painted median can enable a large vehicle to complete a turn without turning into opposing traffic. Restricted access: Where there is a desire to keep curb radii small, restrictions on large vehicles making the turn may be considered. This should be considered in light of the overall street network. Two strategies to extend effective turn radius. For curb radius changes initiated through a traffic calming project, see Traffic Calming Overview: Maintenance.